Christine Haynes just released a new pattern, the Emery dress, and it is available for pre-order. 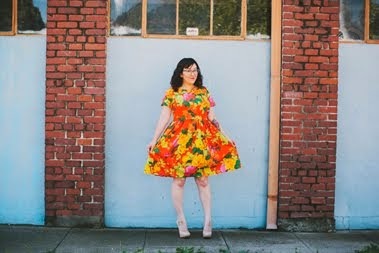 I saw the dress earlier in the year when I was at Sew LA for a little party, so it's safe to say that I have been in love with this pattern since January! The bow detail is adorable and the second version features long sleeves and a cute collar. When I make it it is going to be my favorite winter dress. Fact. I know that many of you love the patterns from Colette Patterns. Sarai, Kenn, Rachel, and the rest of the staff are such hard workers and give so much back to the sewing community. Let's help them out and vote for them in the Martha Stewart American Made contest! If they win first place Sarai and Kenn are giving the prize money to their employees as a bonus. Why is this not so happy news? They are currently in second place and need your help! Please vote!!! P.S. Don't forget to enter the giveaway on my blog! I love the new Emery dress! I think I might have to pre-order it. I've also been voting for Colette everyday and I really, really want them to win. thanks lady for the mention!!! can't wait to see all your Emery dresses when you get the pattern! and yes, vote vote vote for Colette! Sarai and team have earned it!